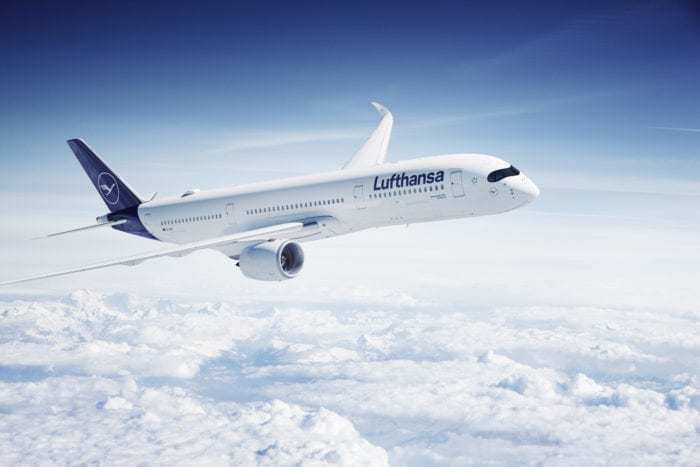 The Airbus A380 vs A350 – What Plane Is Best? In the past, we discussed how the Boeing 777X is the perfect replacement for the 747. But now that the Airbus A380 has been discontinued, is the newer Airbus A350 the perfect replacement? Or rather, is the A350 even a match for the glorious double decked airbus aircraft? Singapore Airlines A380. Photo: Wikipedia. On paper, it looks perfect. Both are long-range, high capacity aircraft, allowing airlines to transport hundreds of passengers across the globe. Both are cutting edge (for their time of development) and both are considered some of best aircraft flying today. But they are not equal, so which is better? Which aircraft will we be comparing? Whilst there is only one version of the A380 (there have been some minor improvements over the years, such as adding sharklets to the design, but overall the plane is still the same), there are currently only ‘two’ variants of the A350. The first is the A350-900, essentially the base model that all A350s are built from. This variant has an additional version, which is the special A350-900ULR (ultra-long-range). This is the aircraft that Singapore Airlines uses to fly from New York to Singapore on the world’s longest route. The second version is the high capacity A350-1000. Bigger and better than the -900, this one is a worthy contender for the A380, and will be the focus of this article. Singapore uses the A350 to fly the world’s longest airline route. Photo: Singapore Airlines. There is a rumor of a further stretch of the A350-1000, dubbed the A350-2000. This one would have a longer range and carry an extra 45 passengers (up to 427) to compete with the upcoming Boeing 777x. Let’s begin by looking at the raw statistics of each aircraft. It’s clear from the outset that the A380 is going to dominate any conversation about passenger capacity (until Russia starts flying its over-the-top A380 killer) with 853 max passengers in a one class layout. The A350-1000 can only hold 440 max passengers, but that’s only 150 less than the A380 when comparing regular airline configuration. That being said, not many A350’s have a first class (as many airlines no longer want to provide it) and thus it can be difficult to compare between the two aircraft. A380s have extra perks, such as showers, bars, and lounges for their premium guests. Surprisingly, for all its size, the A380 can’t actually go as far as the A350. The A350-1000 can travel an additional 800km than the A380 (with the A350-900ULR traveling up to 18,000km) and can open up new routes that the A380 simply can’t accommodate. This flexibility and money making potential guarantees the A350 to be far more useful. This is especially true as the world shifts away from the classic hub to hub model (London to New York) and towards point to point (Manchester to Boston). Cargo or freight is a major revenue earner for airlines, especial those on routes that criss-cross across the world (say that three times fast). The A380, for all its passenger capacity, is not actually a very good cargo carrier. The A350 is able to carry around 20 more square meters of cargo. This lets airlines rely more on lucrative, consistent mail contracts rather than passengers who demand food whilst flying. An interesting point of trivia is that Airbus has actually considered a cargo variant of the A380 in the past, but never went ahead with actual production. Let’s talk about fuel efficiency. As mentioned in many previous articles, there is one major downside to flying what is essentially a two-story building across the planet. Fuel consumption. The A380 needs to carry twice as much fuel as the A350, yet flies almost the same distance. This means that not only is the A350 twice as fuel efficient (obviously because it weighs far less too) but that it costs airlines less to run too. As we can see from the graph, the A380 is one of the least fuel-efficient aircraft operating in the world today. The Airbus A350-900, pictured above, is far more fuel efficient per passenger, thanks to new engines, engineering, and design principles. Simply, the A350 is the better aircraft if your fuel budget is tight (looking at you Emirates!). Quieter engines and more soundproofing (which has the opposite effect of allowing passengers to hear their neighbours more loudly than they might like). From above, we can see that it’s night and day which is cheaper (although keep in mind most airlines pay only 50% of the listed cost). The A350 is cheaper to run and cheaper to buy. The A380, not only is more expensive to operate and buy, but more of a challenge to fill too. If the point of profit is 50% capacity (just an example), an A350 will be profitable quicker than an A380. Overall, whilst the A380 can carry more passengers than the A350, the latter is simply a more modern aircraft. A modern aircraft for a modern world that doesn’t need flying showers with half a thousand people on board. This author loves the A380 and hopes that the A350 can win their love also. Let us know in the comments which you think is better? You also need to add in longevity and lifespan. The circular fuselage of the A350 should have a longer lifespan than the oval fuselage of the A380 as far as pressurization cycles are concerned. The A350 has also an oval fuselage. Like the Concorde, the A380 redefined commercial travel in their own times. The style and comfort of each of these airplanes cannot be matched by others. A380 was/is the epitome of flying. The pleasure and excitement it exuded made the journey memorable. how many people fly from Spokane, WA to Lubbock, TX a day? The main reason that the A380 has become unpopular with airlines is that it is difficult to fill on a consistent basis. Anytime an aircraft closes its doors with empty seats, those seats can’t be sold. Airlines currently prefer to offer more frequent flights with smaller aircraft so that they can sell as many seats as possible, and higher frequencies are also more popular with business travelers who pay full economy or premium cabin fares. Point-to-point is becoming a more favored model than hub-to-hub, for pretty much the same reasons – business travelers prefer direct flights to layovers. First class may be disappearing, but business class in 2019 is more luxurious than First Class in 1999, so it matters less that there is no “First Class”. Some airlines will probably always have first class, but it will be fewer and fewer seats. I do not understand your point. If A380 carries almost twice as many passengers compared to A350, you then need 2 A350s to replace one A380. How is that possible that it is difficult to fill one A380, but it not that difficult filling two A350s the same day? An airline, for example British Airways, on a premium route, say LHR – JFK, would prefer to have two flights, e.g. leaving LHR at 10 a.m. and 11 a.m., using a smaller plane, than to fly once with a larger plane. Business passengers, who provide a lot of profit for airlines, prefer more frequent departures. BA has never flown the A380 between LHR and JFK, preferring to use smaller jets on an hourly departure frequency. Looking at tomorrow’s timetable, BA has 8 flights between LHR and JFK, leaving every 60 – 90 minutes during the day, operated mostly by 747 (it used to be 767). A business traveler paying a premium fare, knows that s/he can turn up at LHR or JFK and get on a flight at a time that suits them. If BA were to use its A380 aircraft on this route, it would either have to fly them at low load factors or cut back on frequency. On this premium route, its customers prefer higher frequencies. Try comparing the average cost per seat. Outweighed by fuel burn? A220 or A380, which one is the best? Ho wait, better idea, Caravelle or A350, which one is the best? The A350 and the A380 fill a completely different need. The A350 is the ideal aircraft from or to a hub. The A380 is a great aircraft hub-hub where one of those has few flight slots. The price of the slots can be so expensive that it becomes a liquidity issue… That’s why British Airways keeps its A380 despite taking the largest B777-9X. And at the right price, BA could take some more. The chart has a couple of questionable data points. I find it very hard to believe the calculations that placed the Boeing 744 in the same efficiency rating as the 748. In researching the data source, I see it is based upon the ICCT study done on Trans Pacific flights. This modeling factors out cargo differences, but does not do so for passenger load factors – the latter numbers are part of the efficiency calculations. The poor performance of the A380 is not only due to its relative inefficiency compared to newer aircraft, but also its limited ability to carry revenue cargo, which is part of the calculation for the chart given here and illustrates one of the key shortcomings in A380 operations – that is the need to fill the aircraft with passengers on a day to day basis. The comparison is therefore related to passenger load factors, operational costs unique to Trans Pacific routes, and revenue cargo abilities vs fuel burned. In addition, regarding the 744 v 748 figures, the model is obviously comparing similar max seat configuration numbers between the two aircraft, despite the 748 having the ability to carry 50-60 more passengers. 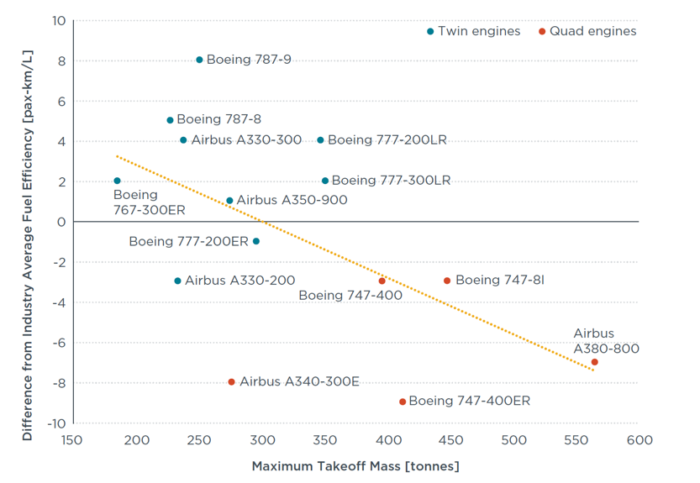 What really stands out from this chart and others from the same study show is how much more efficient the 787 family is in comparison to the A350 series using real world data and actual airline configurations, so the question should actually be the 787 v A380 or perhaps more telling, the A350 v 787. Is it really ok to calculate airplane economics by comparing fuel efficiency to maximum take-off mass? It is not “take-off” mass that pays for the trip. It is passenger that does it. Isn’t it more reasonable to take all the costs of flying a plane (fuel, flight staff, airport charges, etc.) and divide it by number of passengers flown? I also doubt if flying 12+ hours is an advantage. I’d rather fly 6 hours and have a rest for an hour or two somewhere in the middle of the road. Airlines could save a lot of costs by buying cheaper planes but having more efficient processes at the airports which are becoming a total mess these days. Bear this in mind: the A350 is not as big as the A380, hence they are not comparable. The super jumbo can be even more superior if the airframe is stretched and the engines are revamped. It will be well replacing up two 2x A350s. I agree with George Veritas on comments about the fuel efficiency. This is a driving point on who makes money on a route and who loses money. That is why it is not surprising (although it is disturbing) to see that A350 orders since its first deliveries do seem to have a bit of a parallel to those of the A380. The A350 has the good fortune of a much larger backlog from before it entered into service, but its longer term future may resemble that of the A380. lobbying lobbying according to charts airbus should not have any clients. How to diffuse hidden false info.